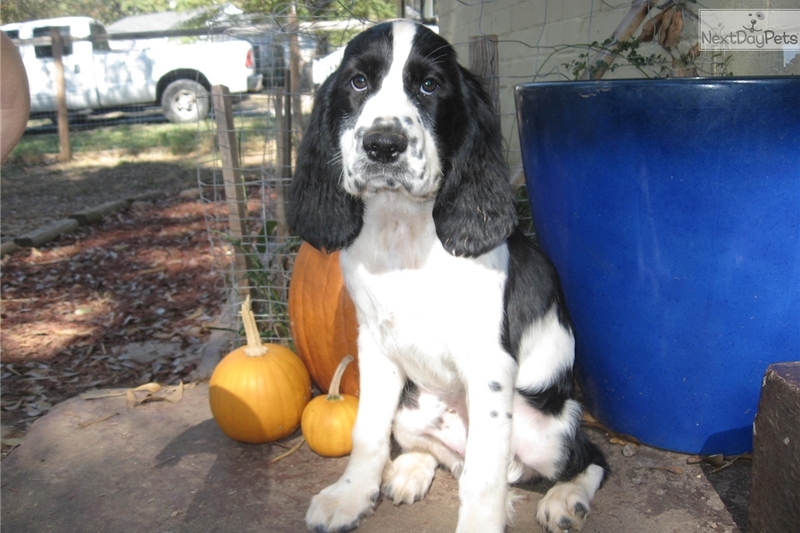 This English Springer Spaniel nicknamed Swan sold and went to a new family. All of our pups are raised in our home where they are given lots of love and interaction. 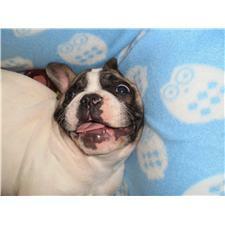 They are well socialized with other dogs and exposed to many sounds and experiences making them well rounded pups. We are looking for the perfect forever homes for our pups... each puppy has a different personality and energy level. All of the pups are medium drive...If one of the pups catches your eye...please contact me about the specific one. This will help the perfect match process of our email interview. A puppy from us is a family pet...not to be bred under any circumstances and will come with a spay/neuter contract on day of pick-up. We only allow puppies to leave here after we are 101% sure the home is a perfect match. We had two litters of puppies and started with 12 all together. "Dozen" had 7 pups July 25th and "DeeDee " had 5 pups July 30th. .
*** "Dozen's" litter----Male "Tortuga" -B/W maybe light sable" 12.8lbs ... Females..."Swan" B/W 11.8lbs & "Calipso" B/W light sable 12.2lbs. Our puppies are crate & pee-pad trained...House breaking depends on the house? We let the puppies outside every time they wake up from naps and such. We also do not let any puppies run around this house unattended. If they begin to sniff around...we put/or call them outside to reinforce their training. When using crates for training...Since dogs are den animals and like to keep their beds clean...allow enough space to stretch-out, but not too much so he could use a corner for accidents. We personally like crates that have a removable divider...to allow the puppy use the crate longer if needed. Medium to Large crate would be fine. Feeding and timing... A good way to prevent accidents in the house or crate is knowing when the little guys has to pee or poop before he/she does. Every time they wake up...go/take out side... encourage them after they pee/go.. When feeding meals... time how long it takes him/her to go afterwards...and this will help in the future. We feed the pups at 7am and 2:30pm...this allows plenty of time for them to go before bed time. If you decide to feed the pup later in the day...just time them and then make sure again before bed. We usually put the little guys to bed around 11pm. A little about the parents... The fathers/sires are owed by a local ESS breeder (which has the most laid back dogs/couch potatoes in the world) and the mothers/dams are my little active girls. Justus/tri-color stud 52lbs was bred with DeeDee/ blue roan 40lbs and Ambrose/sable stud 50lbs was bred with Dozen/liver roan 42lbs . The breeder and I felt matching the perfect temperaments would produce well-minded and a keen sense of loyal friendly puppies. The girls (DeeDee & Dozen) love fetching, hiking, camping , kayaking, and about anything in the world outside. All our dogs sleep inside and have indoor manners. This helps with everyone having a bed... despite the nightly dog pile at our feet while watching TV. We are only able to have litters when time is allowed from year to year. When we do have puppies available... I am here 24/7...During that time...I will work from home and care for the puppies. Meredith and I do not own intact males...and find it is to our benefit and the puppies to have complete control over our planned litters. This is Dozen's first litter and DeeDee's second. Both of my girls enjoy teaching and playing with pups and took turns nursing the whole bunch. Our shepherd actually is given puppy duty in the yard to let the mothers have a break with me...DeeDee & Dozen want big girl time. We have a strong pack mentality and sharing the load helps the pups with their social skills/manners and playing with older trained behaved dogs influences their behavior. The puppies are acclimated to thunderstorms and loud noises. They respond to "clicks & whistles" for commands and are pee-pad trained. Their average day... wake-up around 6:30/7am go outside to pee/poop/play...7-8am breakfast and I watch to see how everybody is doing/eating nicely... between 9am-11am the puppies have complete go wild play with toys and such outside...I watch/observe through the windows and let the older dogs take turns playing outside with the puppies.. Around lunch time everybody comes inside for nap time and around 2:30-3pm I start making everyone's dinner the pups eat and we all spend time outside until 5:30-6pm until Meredith comes home from work. We usually have a puppy party inside and look everybody over. The puppies and the mothers go outside for play until 8-9pm and then we have another nap time inside/kitchen...this allows the pups to watch our activities and to learn patience as we take time for us and the older dogs/brushing/rubbing and such. The days is almost over and the puppies go outside for pee/poop before bed at 11pm. ..All puppies will have up-to-date shots/de-worming & vet records, spay/neuter contract at pick-up and you will receive limited AKC registration "no breeding rights" after they are fixed.